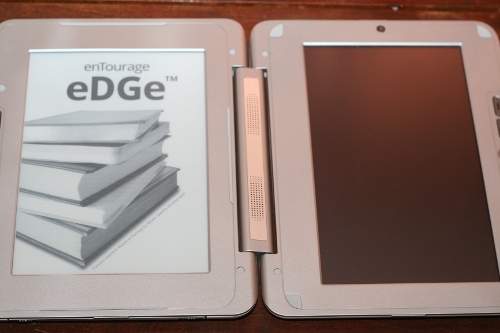 To say that the enTourage eDGe dualbook is “just an e-reader with a bolted-on netbook” (or vice versa) is to pretty dramatically miss the entire point of this thing. The eDGe exists in a category all by itself, because it does an awful lot more than just an e-reader or just a netbook. As a unique product, there are a couple of unfortunate shortcomings, but on the whole the dualbook represents an exciting glimpse at new ways to access and use technology and content. Devin pooh-poohed the eDGe recently, but I’m pretty excited about it. The left half of the eDGe is the e-reader. The right half of the eDGe is an Android-powered touchscreen netbook. My fourteen minute video above shows some of the neat features of this new device. At three-ish pounds, the weight of the unit is not too bad. The construction is fair, but frankly it doesn’t feel quite as rugged as I would like. The two halves do not lock in any way — neither mechanical nor magnetic — so when it’s “closed” it pops open just a little bit. The hinges are not loose, though, so it’s not like the eDGe flips open in the same way a real book does: you need to actually open it. The integration of netbook and e-reader is very well done. Navigating the library on the netbook portion allows you to see your available texts without affecting the currently displayed book. So if you merely want to look up the title of another work in your library without actually leaving your current selection, for example, you can. Battery life is good, especially if you manually lock the touchscreen portion of the unit: this allows you to use the e-reader portion for considerably longer periods. The dual-screen and dual-functionality of the dualbook allow for more than just “reading e-books + some other task”, like reading email or taking notes or looking up details on Wikipedia. It allows rich content to be embedded in an e-book that can be accessed on the touchscreen: you can send selections from the e-reader screen to the netbook screen. You can select a portion of the book you’re reading — whether a section of text, or an embedded image — and view it on the netbook screen, with the added ability to zoom in and zoom out. The zoom doesn’t improve the quality, unfortunately, so since most PDFs and e-books drastically compress their images, zooming in merely displays a big jagged image. Hopefully this situation will improve over time, and higher fidelity images will be embedded in e-books. There’s an interesting application for this feature, though: being able to review a figure or diagram separate from the page on which it is displayed. In academic contexts, this can be a really useful ability. Whether you’re studying physics or art, you can keep an image or diagram open on the right while you continue to read the text on the left. No more flipping back and forth between pages to refer back to a figure. In addition to viewing images as described above, video and audio files can also be linked to and accessed from the e-books. Notes can be added to e-books, and those notes can be viewed on the touchscreen in an indexed display. This lets you review annotations you may have made to a work, and jump straight to a specific portion of the e-text. You type up a note on the touchscreen side of the unit, so you don’t lose sight of what you’re reading. The e-book screen can toggle between displaying an e-book and becoming a free writing surface. Using the stylus you can handwrite notes, sketch, doodle, do long division, or whatever. Anything you create in this way can be exported to PDF, so you can share your creations with others, or just keep an archive of your work. The unique form factor of the dualbook takes some getting used to. I found it equally comfortable to use the device in both “full open” and “folded over” configurations, though it took me awhile to find where to put my hands so that my fingers and thumbs didn’t accidentally hit the buttons. My understanding is that this is a pretty common complaint against most e-readers. Perhaps the biggest shortcoming of the eDGe currently is its use of Android. Android was designed for mobile phones, and the eDGe is not a mobile phone. This has interesting consequences. The first is that the eDGe is prohibited from accessing the Marketplace in the normal fashion. Use the browser on the touchscreen, and try to find an app. Almost all links to apps use the market:// URL. Clicking any of these in the default eDGe browser produces an error that it doesn’t know how to handle that URL. If you can find a .apk Android package, you can load it manually onto the eDGe and install it, but this is currently a laborious process. According to Doug Atkinson, VP of marketing and business development at enTourage Systems, there are plans to build their own app marketplace, so that third-party Android apps can be easily installed. There is currently no ETA for this. Another side-effect of using Android, and the default browser, is that file uploads are disabled. Again, this is because Android is built for phones, and Android on phones doesn’t allow file uploads by default. (The same currently holds true for Safari on iPhone, incidentally.) Once enTourage’s app store opens up this may no longer be an issue, but the lack of file uploads does affect the usability of the eDGe in academic contexts. Many colleges and university have online course management systems through which students upload completed assignments. You won’t be able to upload anything from the eDGe right now, so it’s not going to completely replace your desktop or laptop computer. The other big problem with the eDGe is the eDGe bookstore. The interface you see using a desktop browser at www.entourageedge.com is not the interface you see when visiting that site from the eDGe itself. enTourage Systems has designed their book store to work reasonably well with the eDGe’s small screen and limited navigation controls. The problem is actually finding the content you want. If you don’t know exactly what you want, you’ll be required to sort through page after page after page of offerings: there is no way to sort by popularity, or publication date, or price, or author name, or title name. You can browse books by subject, but there’s no there’s no way to further refine the listing. I don’t know how enTourage is sorting their books, but you’re forced to live with whatever organization they’ve chosen to use. Again, Doug Atkinson tells me that this will evolve over time, and that getting the store up was priority number one. Making the store better is priority number two, and hopefully will happen soon. This is my first real experience with an e-reader of any sort, so I’m probably just now discovering a lot of what other folks have already found. Like how crappy footnotes are, for example. The eDGe has this whole other screen available, but viewing a footnote in an e-book still requires me to move away from my place in the text on the e-reader side, read the footnote, then click back to the page I left. That’s stupid. I mean really stupid. Even without the use of the second screen, I don’t see why a footnote requires its own full-page content display. The e-reader screen clearly supports modal dialog boxes: I think footnotes should display in a pop dialog box. Another major problem with electronic content is ownership. You don’t own the books you buy. You have merely purchased the right to read the work on this device, and maybe on a couple of other devices. This really bothers me, because it strips away the privileges granted to us under the first-sale doctrine. When I finish reading a physical book, I can loan it to a friend to read. Or I can give it outright to them. Not so with e-books and DRM. This really, really bugs me. An interesting consequence of this situation is that the used textbook market will be completely eliminated in the digital realm, allowing textbook published to enjoy full price sales for each of their digital texts. I might appear hyper-critical of the eDGe in this review, but that’s because I really want to see this thing succeed. I am excited by the possibilities that this form factor introduces, and I think the convergence of features in a product like this will provide better long-term functionality than shoe-horning either feature set into a form factor that doesn’t adequately support it. That is to say, tablets and netbooks don’t make good e-readers in my mind, and e-readers don’t make good general purpose Internet devices. Of course, the only constant is change, so it’s entirely possible that the eDGe will be leapfrogged by some new product within a year. And enTourage is a pretty new player in a very competitive field, so they may not be able to stand up against larger companies, should those larger companies decide to compete. But for now, I think the eDGe offers a very compelling product at a pretty good price.